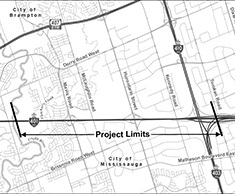 AECOM Canada Ltd (AECOM) has been retained by the Ontario Ministry of Transportation (MTO) to undertake the Detail Design Project for the widening of Highway 401 from the Highway 403/410 interchange to the Credit River in the City of Mississauga, Regional Municipality of Peel, a distance of 7 km (see Key Map). The project will complete the expansion of Highway 401 from Highway 410/403 interchange to the Credit River, from its current 6 lanes to a 12-lane core/collector system including a High Occupancy Vehicle (HOV) lane in each direction. The project will follow the approved environmental planning process for Group ‘B’ projects under the Class Environmental Assessment for Provincial Transportation Facilities (2000) with the opportunity for public input throughout. We encourage you to review this website and provide us with your feedback. Project updates will be posted over the course of the project. Please check this page regularly for project updates, the date and location of the Public Information Centre and the Notice of Design and Construction Report Filing. For information requests in French, please contact Mirjana Osojnicki at mirjana.osojnicki@aecom.com.